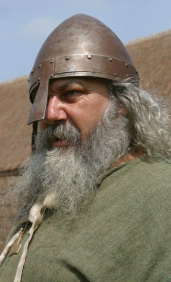 Vikings were Nordic people (Danes, Swedes, and Norwegians) who raided and settled in large areas of Eastern and Western Europe during a time of Scandinavian expansion from the 9th through 12th Centuries. The origin of the word "Viking" is debated. In the old Norse language, Viking means a man from vík, which referred to a bay or inlet. The name was used because the first Viking raiders came from Víkin (which was a specific bay in the southern part of Norway) or because the raiders waited in sheltered bays for their victims. Few written records exist of the Vikings before their conversion to Christianity. (Isn't that always the case?) As a result, knowledge of the Scandinavian people is limited. 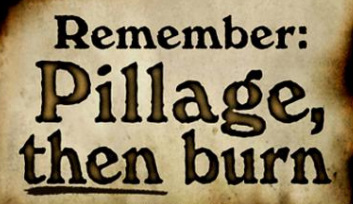 Historians rely on stories written by the people the Vikings attacked... because, you know, those accounts could never be biased [insert eye roll]. Still, the raids of the Vikings in the 9th and 10th Centuries make up some of the fiercest moments in the Middle Ages. The Vikings loved going after the British Isles, the Atlantic and North Sea shoreline of the Carolingian Empire (which included what are now France and Germany), and to the east on what became Russia. Because the climate in Scandinavia was downright awful (who doesn't like 365 days of winter?! ), the Vikings found their resources and food stretched to the max. 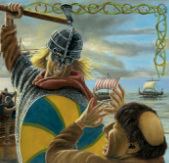 The Vikings landed on undefended coasts and attacked churches as well as isolated farmsteads, towns, and villages. Their hit-and-run attacks were devastating and sent sheer terror through Europe's population. Their well-constructed longboats could carry 50 or more men, and because of their very shallow draft, these boats were able to travel up rivers to settlements that had seemed immune to maritime attack. Sieges of and raids on Paris during the 840s show just how far into the heartland of continental Europe the Vikings could strike. By 750 AD, the Roman Empire had given way to three heirs: the Byzantine Empire (which was stable because of its emperors); the Islamic World (which was stable because of its Caliphs); and the West (which was NOT stable because it was made of a bunch of smaller kingdoms that constantly warred with each other for supremacy in Europe). With Europe fragmented into tiny kingdoms, it was ripe for pillaging and destruction at the hands of the Vikings. To help fight back, kings began hiring soldiers to assist in their defense. They paid them with land... not money. Thus began feudalism. 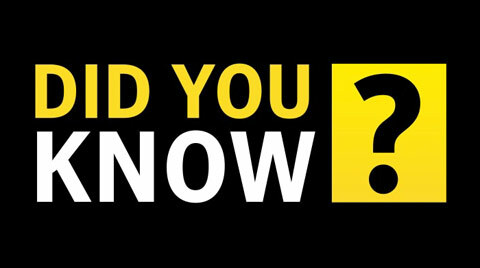 Despite the common belief that in 1492 Italian-Spanish navigator Christopher Columbus became the first European to reach North America, most historians and archaeologists believe that Viking navigators, by way of Iceland and outposts in Greenland, established settlements in North America as early as about 1000 AD. 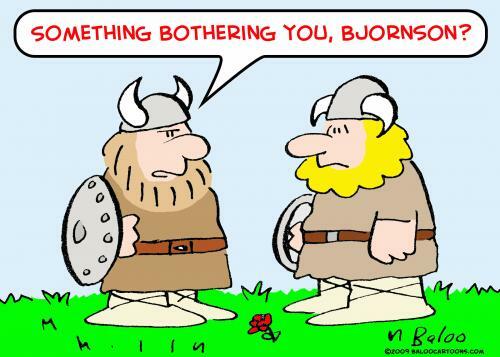 Leif Erickson (also spelled: Ericsson, Eiríksson, or Erikson) was a Viking that’s considered to be the first European to set foot on North American soil. Going to Greenland, he got lost and landed in Newfoundland, Canada around 1000. Erickson voyaged from Greenland, where he was living with his father, to Norway, the homeland of his family, shortly before 1000. There, according to one tradition, Norway’s King Olaf I converted Erickson to Christianity and sent him back to Greenland to win its Viking settlers over to the Christian faith. Journeying westward, Erickson lost his way and landed on the North American shore. At first, the Vikings' impact was primarily disruptive and destructive. Gradually, the Vikings became part of the larger European community as they were attracted by a more settled life, and as Europe's feudalism helped fend off their attacks. Nevertheless, the Vikings add an interesting chapter to Medieval Europe’s history. things on their heads in order to make the Viking seem more demonic and barbaric (as though they needed help with that!). Still, there have been Viking helmets found with horns, but these were for religious ceremonies or for sacrifices... but never in combat. Bummer... they look really cool! 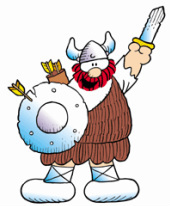 Why, yes, Hagar... you really are horrible... horribly furthering the horned stereotype of Vikings. The pre-Christian religion of the Vikings was similar to that of other Germanic tribes. They worshiped a number of gods, including Odin, the god of war and leader of the Norse gods; Thor, the god of thunder; and Balder, the god of light. 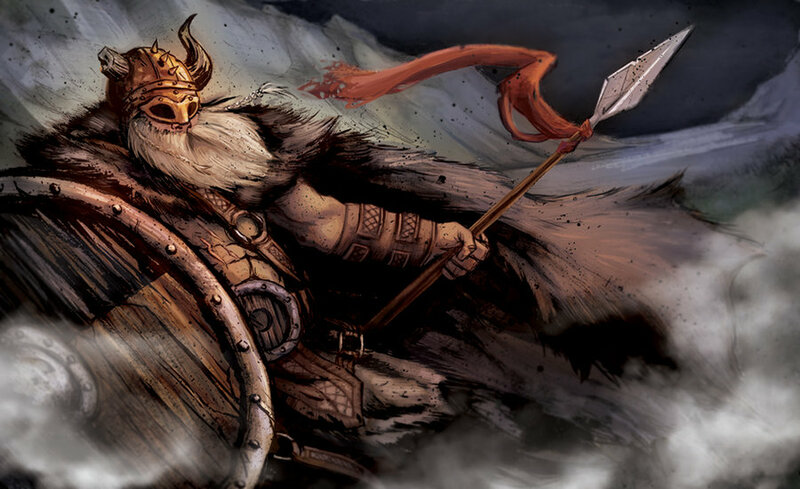 Viking warriors believed that if they died heroically they would be called to dwell with Odin in Valhalla, his palace in the realm of the gods. Opposing the Norse gods were a host of evil giants, led by Loki. Vikings believed that both gods and men would eventually be destroyed in the Ragnarok, a mighty battle against the giants, but that a new, peaceful world would emerge from this disaster. Our days of the week are named after these various gods. Which came first, the chicken or the egg? 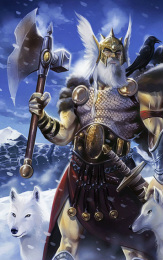 Odin or Zeus? "Immigrant Song" is a song by the English rock band Led Zeppelin. 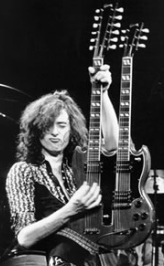 It was released as a single from their third album, Led Zeppelin III, in 1970. The song's lyrics are written from the perspective of Vikings rowing west from Scandinavia in search of new lands. 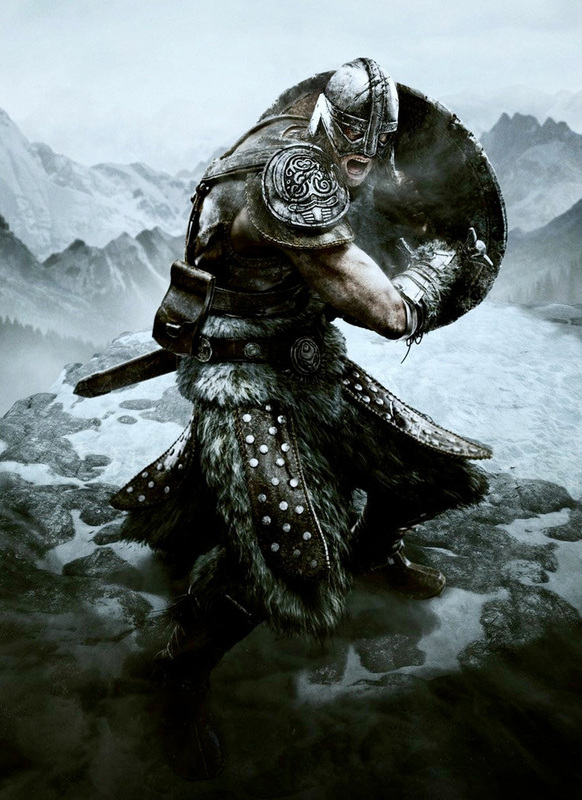 The lyrics reference Viking conquests and the Old Norse religion ("Fight the horde, sing and cry, Valhalla, I am coming!"). Not sure if you've heard it? It begins with a very distinctive, wailing cry from vocalist Robert Plant. You can listen to the song by scrolling back to the top of the screen and clicking the play button. Q: How do I say "I do not speak Norwegian" in Norwegian? Dammit, DreamWorks! The horns! The horns!